Deal Book. 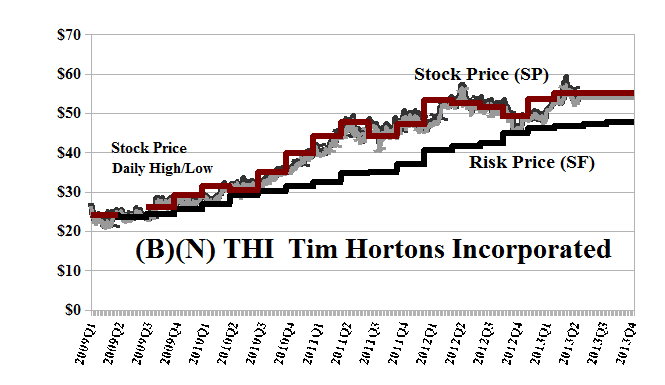 They’re rolling up to the rim at Timmy’s but it’s the takeout window that they want and not so much the coffee and doughnuts (CBC, June 18, 2013, Tim Hortons being circled by Wall Street hedge funds and Reuters, June 18, 2013, Tim Hortons shares climb as second investor pushes for change). Scout Capital Management LLC is a hedge-fund and filed an SEC Schedule 13D on June 6, 2013, declaring 8.4 million shares or 5.5% of the common shares outstanding, and they follow Highfields Capital Management LP which now holds about 6 million shares and a 4% interest. Undoubtedly, the management and board of Tim Hortons have already discussed ideas such as buying back some of its own shares, or scaling back on the U.S. expansion plans, or possibly spinning off its real estate assets into a trust such as a REIT which other firms such as Loblaw Companies Limited and the Canadian Tire Corporation are actively engaged with at the present time, and why not Shoppers Drug Mart, McDonalds, Sears Canada, Target, the banks and all of their properties, and so on. Of course, Tim Hortons would have to own or control the REIT in order to avoid yet another activist shareholder suggesting that the REIT should sell the properties in a “hot” market, or charge themselves more rent, or do less maintenance and take down the signage in order to increase “shareholder value” by filling the doughnut holes. We’re not impressed at all and if creative solutions are required, as they say, where will they get the time to advise both Tim Hortons and Post Holdings (another of their alleged basket cases) when their own website is in such dire need of creative maintenance? Obviously, they are “cereal” activists, so to speak, who exploit smaller capitalized companies for personal gain – if less than $10 billion, then just $500 million buys 5% and who doesn’t have $500 million these days? In our view, “greenmail” and noisy shareholder activism is just an updated variant on pump & dump. But there are other problems, too, and they go to issues of responsible corporate governance and the representation of all the shareholders and stakeholders in the face of noisy activism akin to politicking and vote buying with a questionable display of leadership that amounts to shouting with a proxy and a power-point. For example, from a technical point of view, trivial measures such as the price to earnings multiple [P/E] and the earnings per share [EPS] are irrelevant to gauging the standard of the stock price performance, or the “shareholder value”, or the efficiency of the firm, and we challenge the business whiz-kids to prove otherwise. Do that and get back to us. And if they can’t do that, or fix their website, what are they supposed to know about “capital structure, capital expenditures, timing and magnitude of share repurchases, management compensation metrics, and technology” (ibid, CBC) that we should pay for on our time? And they left out ramping up the debt and raiding the employee pension plan. Humph. And if they really want to improve the efficiency of the business and operating profits, they could take up a clip board, serve coffee, make sandwiches, sweep the floors, greet the customers, and so forth, and work there alongside the 2,500 other employees who probably have a lot of good ideas based on experience. And where has the Board been all these years, on our payroll, and not noticed these things discovered by the newbies and born-again coffee magnats? Moreover, we own the stock because we “like” it and we’re not alone because the stock has been trading at or above the price of risk since at least $25 in 2009 and it’s now trading at $50 to $60 on its own efforts and with a dividend yield of 2% on coffee that’s better than at home. Please see Exhibit 1 below and our previous Post. And what if we and other large shareholders such as FMR LLC which owns almost 9% of the stock, or the Royal Bank of Canada and the TD Asset Management Incorporated which own more than 10% of the stock between them, decide to take our money, interim profits, and go home, how that will affect the stock price? Tim Hortons Incorporated, of Oakville, Ontario, develops and franchises quick-service restaurants that serve food, including coffee, other hot and cold beverages, baked goods, sandwiches, soups and other foods products to legions of students, senior citizens and retired folks, travelers, baby-sitters, and workers on their way or on their break. From the Company: Tim Hortons Incorporated engages in the development and franchising of quick service restaurants primarily in Canada and the United States. Its restaurants provide premium coffee, espresso-based hot and cold specialty drinks, cappuccinos and espresso shots, fruit smoothies, home-style soups, fresh baked goods, grilled Panini and classic sandwiches, wraps, soups, prepared foods, and other food products. As of December 30, 2012, the company had 4,264 restaurants, including 3,436 in Canada, 804 in the United States, and 24 in the Gulf Cooperation Council. Tim Hortons Incorporated was founded in 1964, has 2,500 employees, and is based in Oakville, Canada.